- Over the past nine days, French forces have achieved meagre results in the offensive ordered by General Sarrail: elements of the French 57th and 122nd Divisions have crossed the Tcherna River and advanced five kilometres, but are encountering increasingly severe resistance. 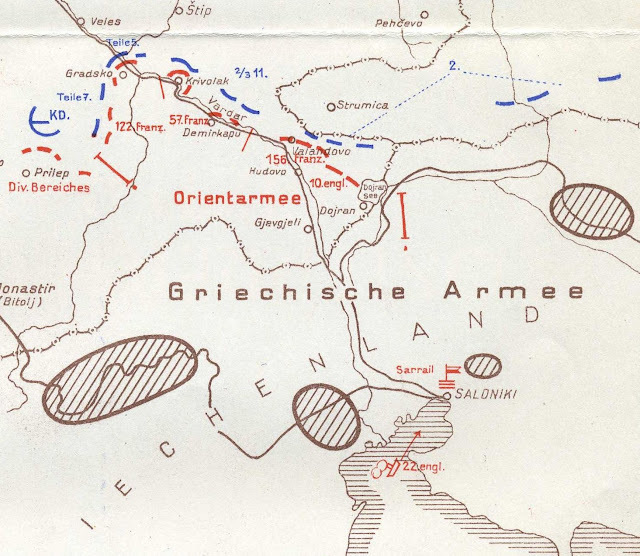 To the southeast, the French 156th Division at the Strumica rail station has successfully counterattacked Bulgarian forces and driven them back across the border. Nevertheless, Bulgarian forces in the region greatly outnumber the three French divisions Sarrail has available in southern Serbia. The front in southern Serbia after the offensive of Army of the Near East, November 1915. - Italian attacks continue today along the Isonzo River. West of Görz, the morning sees back and forth fighting over a stretch of trench on the west slope of Heights #184 near Podgora, while in the afternoon an Italian assault penetrates the Austro-Hungarian line near the church at Oslavija. To the south, the Italian 3rd Army abandons the broader assaults of the past two days to launch a two-pronged effort to envelop Mt. San Michele, attacking from Peteano to the northwest and near St. Martino to the southwest. Three times Italian infantry advance up the northern slope of Mt. San Michele, and three times they fail to gain any ground. To the south, several regiments attack near Kote, but are repulsed with heavy losses. - Recent sinkings by German submarines in the Mediterranean, especially of the transport Calvados off Algeria, has sparked concern both in metropolitan France and French North Africa regarding the safety of merchant ships and transports in the Mediterranean. Under pressure, the French minister of marine instructs Vice-Admiral Louis-René-Marie Charles Dartige du Fournet, commander of French naval forces in the Mediterranean, to reach an agreement with the British regarding a general plans for coordinated naval patrols to prevent submarine attacks. - In Teheran Shah Ahmad of Persia informs Ambassador Reuss that he must secure the approval of the German government before he will ratify the treaty of alliance offered by the latter. This effectively postpones for several weeks the final decision of the shah on the treaty. Meanwhile, the Russian menace to Teheran increases - an advance Russian detachment is encamped forty miles from the capital, while a larger Russian expeditionary force of eight thousand cavalry and six thousand infantry lands at Enzeli today.